Metal Cylinder Lamp 15 cm with Salt Chips, Electric Wire &amp; Bulb Included. 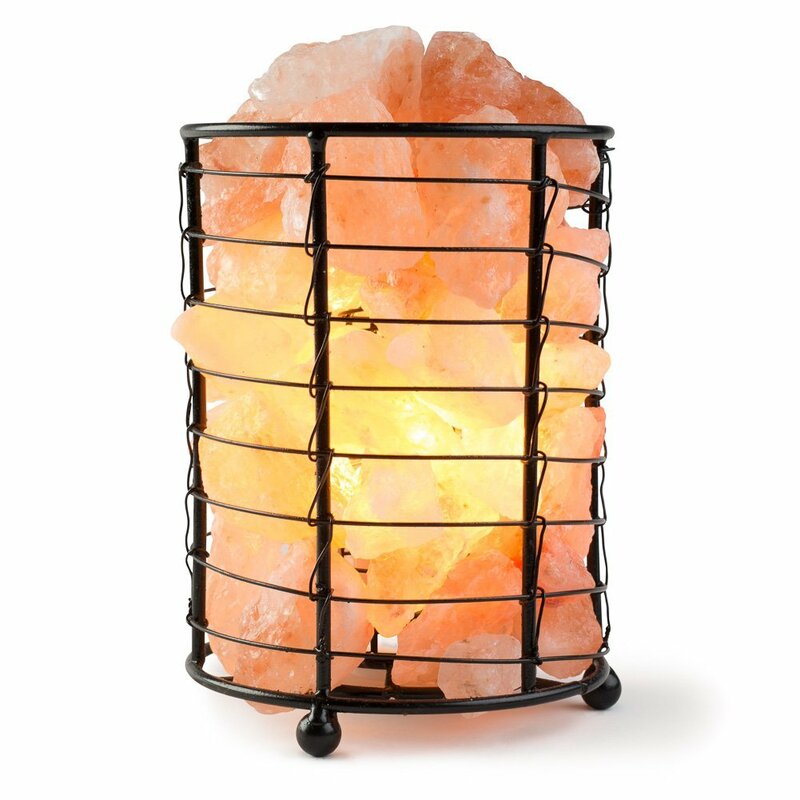 "Himalayan salt lamp emits a number of negative ions into surrounding atmosphere when it is heated by an external source of electric or candles. The heat produced from the lamp breaks down Na CL Sodium Chloride in a process called ionization. This process is enhanced by natural process of NACL and resulting in producing of negative ions which eliminate the positive ions which are present in our surroundings produced from common household items such as, Computers,refrigerators, T.V sets and etc. Thus these lamps make the air clean, fresh and healthy to live in. It also provides a lovely amber color when lit and is wonderful to use as a night light with its soft glow. Also great as a therapeutic addition to any room. Creates a soothing touch in the spa, at the massage &amp; yoga, in restaurants, your dining rooms, living rooms, bedroom and in your office. Crafted Salt Lamps Natural Salt is found in ancient evaporated sea beds underneath great mountain masses, such as the Himalayas, where it has been compressed over time to form solid salt rock, with all the minerals structurally intact. Is hand crafted giving each lamp a unique shape and color. Uses very little electricity with a low wattage bulb. USE:- Negative ions reduce the effects of: Dust, Bacteria, Pet Dander, Radiation, Odor, Insomnia, Allergies, Sinus, Depression, Migraines, Anxiety, Fatigue, Colds, ADHD, and asthma. Salt Crystal Lamps have a similar effect to the ionizer. These lamps emit negative Ions to their surroundings. The ionization helps combat many of the harsh elements that bombard our bodies, causing us to feel unwell. The placement of our lamp in an area that one uses frequently can help balance our bodies, boost our immune system and give back lost energy."